Darien Tax Assessor Anthony Homicki expects a smaller number of taxpayers will want to appeal their tax assessments this year, in part because the assessments didn’t change much, overall, and in part because the town is making more information comparison available to taxpayers. Those were some of the points Homicki made in a recent presentation to the Board of Selectmen last week about this year’s revaluation. The same day, Homicki’s office mailed out 6,500 letters to property owners with their revaluation information. Individual assessments will be used when the town calculates future tax bills, based on upcoming tax rates. You can see a Darien TV79 video of his presentation on Vimeo.com, or at the bottom of this article. I guess the bulk of [property revaluation] changes are within 2 to 4 percent. You don’t have a blanket reduction or a blanket increase. Zoning does come into play. The properties that are in the northern third of town, with two-acre zoning — we saw those, instead of the average days on the market of about 240 to 260 days, some of the larger homes on in the northern section of town have been on the market over 300 days. It comes into play on how much exposure they have and where the regional economy is. [Darien isn’t unusual in this pattern of home sales.] I’ve talked to my colleagues in New Canaan, Westport, Norwalk, even in Greenwich. Eighty-six percent of our tax base is residential. If you look at that line chart […] You’ll see that the median prices, the mean price, sort of stabilized overall. If you look at the averages just above the $1.6 million price range and [compare] the median vs. the mean, it shows a healthy community, a healthy marketplace. Homicki said this year’s assessment doesn’t have wide swings in lots of individual property revaluations, and the process is transparent enough to taxpayers that he doesn’t expect as many tax-assessment appeals as the town has had before. I’ve been your assessor for 14, close to 15 years. I’ve followed this cycle [of town property tax revaluations] a couple of times already. In 2003 there was an update, refreshed with a variety of different software systems. [The year] 2008 was quite the challenge, with the economy changing as quickly as it did. And, in essence, that was a base year of change. We had close to 700 to 800 hearings at that time because we weren’t transparent — we weren’t open for everyone to look at the records and, really, to find and identify what their real estate [estimated value] was all about. In 2003 we had significant changes in waterfront properties, where some of those went up 20 percent. In 2008 we had a significant change in the economy — the recession hit hard and it hit fast. In 2008 we actually lowered values by anywhere from 4 to 6 percent, townwide. I guess the bulk of changes [this year] are within 2 to 4 percent. You don’t have a blanket reduction or a blanket increase. Positives of this revaluation [are] that entry-level [new or rebuilt] housing, 500 or 600 building permits that we have: I find [in] entry-level housing that a lot of these [building] permits [for houses that] have been worked on and become approved [by town officials are in] a price range between $700,000 and $1.6 [million or] 1.8 million. Again, if we had 6,500 parcels and I only had 100 sales, I would be here this evening saying it’s more than a challenge. When you have 600 to 700 sales, there’s a lot of statistics to hit right out of the park. [Over the past five years, Homicki said, the Assessor’s Office has been analyzing real estate sales, getting close to 1,100 sales, although the database includes only homes sold in the last 24 to 36 months. [The property listing] will have a list number on it, the address of the property, a map [number] and lot number, the neighborhood number, acreage, zoning, the style of the property, the date of the sale and the sale price. All 600 to 700 properties are in that database. I think with the Q-and-A and the report I’ve given you, it’s a good overview of where revaluations are. The Tyler [Technology] company is a nationally recognized company that we’ve used in the past. It’s a three-person crew that has been on task for almost nine months. They’ve done a great job, where we’ve, in fact, visited all properties in town twice — the exterior reviews. There’s no state mandate for interior inspection, but we have followed up with averaging, like I said, 400 to 600 building permits a year. We’ve taken photographs of each and every property twice over the past two winters. When my assistant and I visit properties on all the building permits that are given to us, we take updated photographs of those properties, also. The project started, under contract, in January of ’18. We’ve analyzed income and expense statements [of the Tyler company project in Darien], as mandated by state law. Commercial taxpayers give us very thorough, very complete [reports] We have about 95 percent compliance, I think, overall, for the upcoming expense statements. [For] the commercial data collection: all properties have been reviewed and inspected to detail. Valuation of the land analysis and building is something required by state statute. We have to meet statistical standards in order to sign off on this project. They’ll be scheduling these hearings downstairs in the conference rooms [in Town Hall] and we’ll have that [phone] number available through Nov. 29. The meetings that taxpayers concerned about their revaluation can set up a meeting to speak in an informal review with the Tyler Company representatives is Nov. 29, Homicki said. Independent of that, taxpayers can formally appeal a tax revaluation with the town Board of Assessment Appeals, he said. The deadline for that application is Feb. 20, 2019. Informal appeal hearings are available by calling the Tyler Technology appraisers. Formal appeals of the change in assessment can be made by filing an appeal application with the Assessor’s Office on or before Wednesday Feb. 20, 2019. Again, first check on the variety of data on the Assessors area on the Town Website. If you have questions in regard to the value and would like to meet with an appraiser please call: Tyler Technology at 1-877-895-9675 before Thursday Nov. 29, 2018. General questions and concerns are to be directed to the Assessor’s Office at 203- 656-7310 Monday through Friday between 9 a.m. and 4 p.m.
Editor’s note: How this transcript was edited: The transcript published here quotes his words but with some paragraphs rearranged. Elipses — “…” marks — indicate words were removed. Words in brackets were added for clarity — sometimes to rephrase, sometimes to add information. Subheadings have been added. 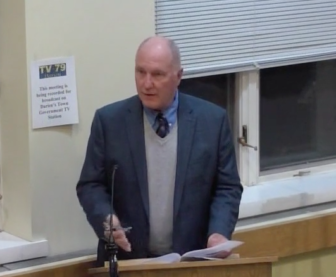 Board of Selectmen 11-13-18 from Darien TV79 on Vimeo.